After months of very little change in the positions of parties - a fact which explains, if not entirely justifies, the dormancy of this blog - the tectonic plates of Polish party politics have started to shift again. After trailing his new party for several months, last weekend former MP and mayor of Słupsk Robert Biedroń (whose status as gay and atheist it seems to be de rigueur to mention, however irrelevant this information might be) announced that it would be called “Spring” (Wiosna), and that it would have a broadly social-democratic profile. Prior to the official announcement, several polling agencies had included “Robert Biedroń’s party” as a separate choice in their surveys, with an average level of support of around 7-8%. Since the official announcement, a couple of polls have been conducted using the official name of the party, so it is now time to see what impact this has on the pooled model. I should also note at this point that I have decided to combine support for Civic Platform (PO) and Nowoczesna (N) into support for the Civic Coalition (KO). While it is not yet certain that both parties will run on a common list under KO auspices in November’s parliamentary election, it is likely that they will, and many polling agencies have started to ask about support for KO (which also contains some small parties and movements of the centre left, but is dominated by the conservatives and liberals of PO and KO) rather than treat both parties separately. In any case, the notion of a separate liberal party as a significant power in Polish politics is moribund: Nowoczesna has been polling below the 5% electoral threshold for several months now, while former Nowoczesna leader Ryszard Petru’s new party, the somewhat optimistically named “Now!” (Teraz!) is struggling to get into single figures, never mind double figures. 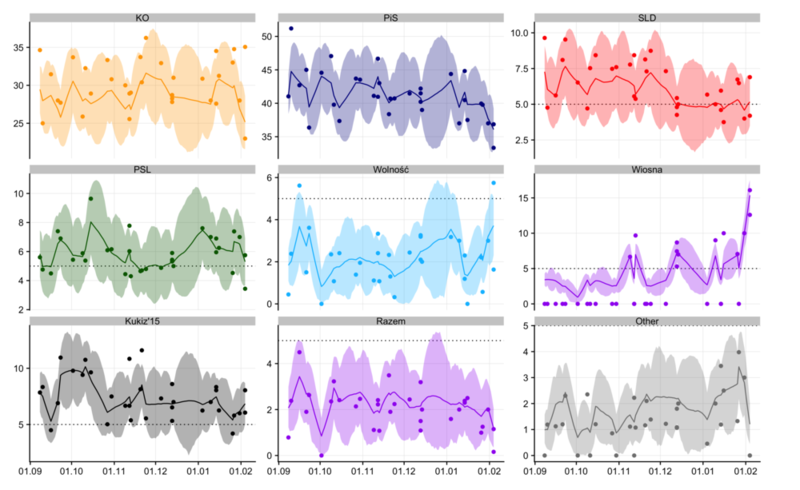 To begin with the latest figures, the pooled poll model shows that PiS - despite a rather inauspicious start to 2019 - still have a 10pp. advantage over KO, and their level of support remains on a par with their 2015 election result. Wiosna are third, on 11% - a figure which falls somewhere between the 7-8% the “Robert Biedroń party” was polling before the official announcement, and the 14-15% they have polled this week. It remains to be seen how much of this support can be attributed to a new-party bounce, and how much reflects the immediate appetite of the electorate for something new and vaguely left of centre. Bringing up the rear are PSL, Kukiz’15 and SLD, all of whom would just about get into parliament on their current showing, but none of whom can feel secure about doing so in November. Wolność and Razem remain firmly below the electoral threshold. Trends over the last six months show more stasis than change for the two main forces, although there has been a slight decline in recent weeks for PiS. If current party strengths were translated into seats, the distribution would look something like the following. It should be borne in mind that in calculating these seat distributions, I continue to weight the parties’ projected performances in individual constituencies by their performance in 2015. In Wiosna’s case, there are no unambiguous data on which I can base this weighting. I have therefore decided to go with the assumption that they are likely to do better than average in areas where KO, Nowoczesna and SLD did better in 2015, so I use the average support for these parties to calculate that weighting. This may turn out to be an unfounded assumption, but it is preferable to assuming that their support will not vary at all across constituencies. The distribution of seats - and the presence of six parties in the Sejm - would mean that even if PiS were to get 37% again, it would not be able to govern alone. The only mathematically and ideologically viable coalition would be with PSL. 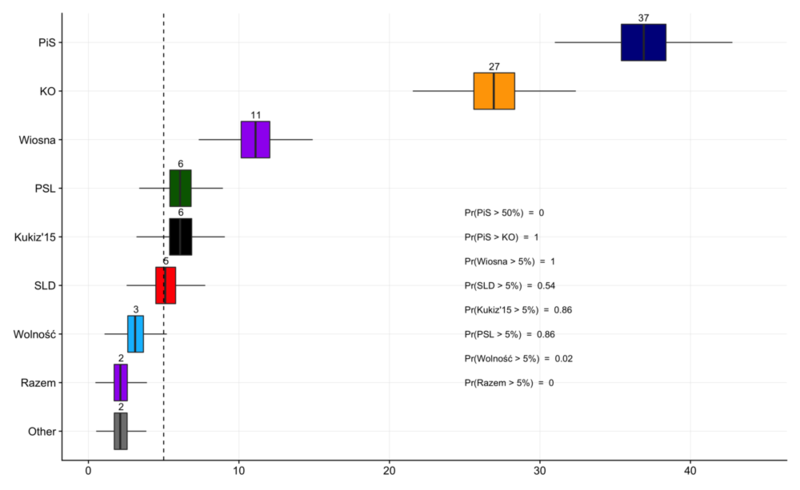 However, a more plausible PiS-Kukiz’15 coalition remains possible given the tendency for the relative strengths of the minor parties to change quite frequently. On present levels of support, and assuming the aforementioned regional distribution of votes, Wiosna would have at least one member of parliament in each of Poland’s 41 constituencies, with the highest proportion in the Warsaw metropolitan constituency, where it would have three. However, it is still much too early to conclude that Wiosna can establish itself as a distinct third force, rather than one of several minor parties jostling for scraps.